BERKELEY, Calif. (AP) — The final seconds of UCLA’s first win of the Chip Kelly era ticked off and the Bruins gathered to celebrate with their traveling fans before performing a rousing rendition of their fight song in the locker room. After five straight losses to open the season, this celebration was a long time coming. Joshua Kelley ran for 157 yards and three touchdowns, the defense had four of its five takeaways in the second half and Kelly earned his first win as a college coach in more than five years by beating California 37-7 on Saturday. UCLA: Bruins freshman QB Dorian Thompson-Robinson was very efficient. He completed 13 of 15 passes for 141 yards including one that deflected off receiver Michael Ezeike’s hands and right to teammate Caleb Wilson to set up Kelley’s first TD. He also did damage with his legs, including a 20-yard run that helped set up one of Kelley’s second-half scores. “Each week he’s gotten better the more experience he gets,” Kelly said. California: The first-half woes for the Bears could be summed up on a late drive. In the closing seconds, Kanawai Noa tried to fight for extra yards instead of going out of bounds on a sideline catch. That forced Cal to spike the ball on third down at the 15. Greg Thomas came on for a 32-yard field goal and hit the upright after being iced with two timeouts, leaving Cal scoreless at the half. “We couldn’t get anything going in the first half, didn’t really get anything started and, for whatever reason that is, it really wasn’t there and we’ve got to figure out a way to get it back,” McIlwain said. “We knew we could play like this. It was just about finding that rhythm and everyone doing their job. Guys in the previous weeks were just trying to overcompensate for somebody else’s job instead of just doing theirs.” — Thompson-Robinson. Lucier-South did a little of just about everything in the fourth quarter defensively for the Bruins. He intercepted a pass on fourth-and-1 to stop one drive. The then scooped up the fumble and returned it for his first career touchdown. He then added a strip-sack. Cal freshman linebacker Chris Fatilua, who suffered a serious spinal cord injury during a swimming accident in June, got a warm ovation from the crowd in his first appearance at Memorial Stadium. He was hurt just before starting his college career. “There’s a lot of emotions that go on, just overwhelming really but just really happy to be out here and be with the guys, just really grateful,” he said. 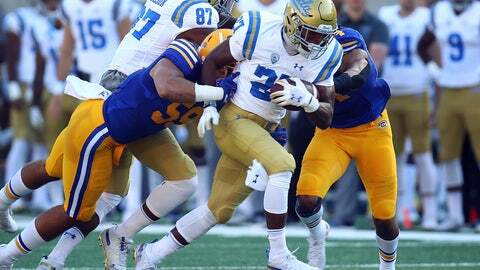 UCLA: Hosts Arizona on Saturday. California: Visits Oregon State on Saturday.